Our 32 Channel NVR Mini is designed specifically for recording high definition security cameras with reliable performance and efficiency. 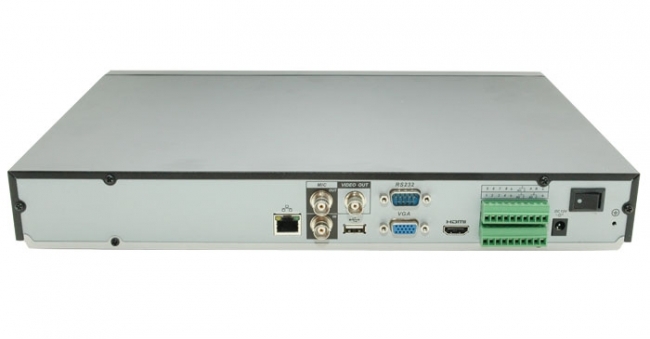 This surveillance video recorder is a stand-alone unit, not a PCI card that needs to be installed or attached to a computer. Our standalone NVR and DVR are based on a Linux operating system that adds a high level of security compared to a PC based system, and is not prone to hacking or computer viruses. This NVR is slim in size and is small enough to be placed just about anywhere. Inside the case, it has the ability to house 2 DVR hard drives up to 4TB each, which is great for motion activated recording. There are also two USB ports which allow connection to external flash drives, or external DVD burners. Our NVRs also provide the ability to create a live back-up of security footage via FTP or to another NVR at an entirely different location. This way, if your NVR is ever damaged or destroyed, your video footage will still be protected by being saved in another location on another device. This 32 Channel NVR has a powerful dual core CPU that utilizes the Linux operating system embedded on a chip. This NVR is operational even when there are no hard drives inside, or when the hard drives have failed. Despite having a Linux OS, the user interface is very easy to use, and self-intuitive to learn all the functions. We also have plenty of DVR instructional videos to help you in the process. Configuration and setup of IP cameras on the network is made easy using the IP Search function in the menu. The NVR can automatically search the network it is connected on for compatible IP cameras. These can be cameras purchased from CCTV Camera World or you can use your own compatible 3rd party network cameras. This network video recorder is a slim line version of our 32 Channel NVRs, but still has all the same great features including alarm inputs for optional connections to an alarm relay to interact with triggers from motion, heat and sound sensors. On the outputs you can attach devices like PA speakers, sirens and strobe lights. Use of network PTZ cameras is also supported with PTZ controls over IP or through RS485. As in all of our security video recorders, there is a 3D PTZ control option which allows for easy control of pan tilt zoom cameras using a simple click and drag motion of the mouse. This recorder also offers remote access through its built-in web server that you can log on to using a web browser, mobile device, or the included Free Central Monitoring Software. After little configuration you can receive up-to-date alerts based off of video based motion detection, optional alarm triggers, or video loss. We also include FREE iPhone iPad and Android Apps so your security camera system is accessible from anywhere in the world. There are also two HD video outputs via HDMI and VGA for displaying the DVR screen simultaneously on two TVs or monitors. This 32 channel NVR will amaze you with its quality and performance. Our machines are built with quality in mind and are backed by a 1 Year Warranty and lifetime Free Technical Support for the life of the product. Feel free to contact our tech support department or post your questions in our forum and we will be more than happy to provide assistance to help you overcome any hurdles. If you are looking for the same great features as this 32 camera NVR but would like more storage space, then be sure to consider our other larger 32 Channel NVRs here. Is it records audio + video ? If you are using our network cameras with built-in microphone then yes you can stream video and audio over the camera's network stream. You can record audio & video from each camera for a total of 32 cameras. would this unit capture/control Lorex IP Cameras like LNZ32P4B, LNB4163B, and LNB3163B? Yes it will work fine with those cameras. Keep in mind you need a PoE switch and the NVR is limited to total 200mbps encoding, which includes incoming and outgoing bandwidth. The NVR can display up to eight 1080P cameras in playback mode or a total of 16 megapixels. Is this device compatible with D-Link cameras DCS-4603 and DCS-4703E? D-link cameras are not compatible with our recorders.